Most of its calculator users programmed for the TI-84 Plus, TI-84 Plus C Silver Edition, TI-84 Plus CE, TI-Nspire and HP Prime calculators, with some Casio FX-9860G, mobile and PC development going on every now and then. Non-calculator discussion focuses heavily on music and retro gaming and there were various mobile and computer programming projects in the works most of the time. The forum portion of CodeWalrus and its embedded shoutbox are slated to remain open as long as it's in functional state, after which they will be either converted to PhpBB 3.x or put in read-only mode. 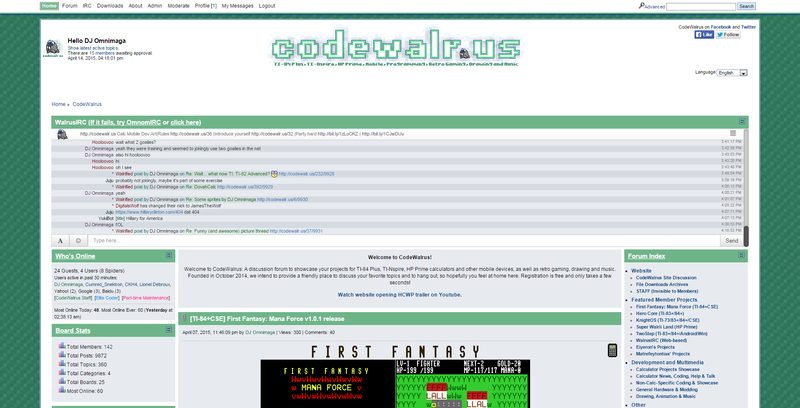 Although CodeWalrus had no new TI program release to offer in its early days, it still managed to have a fast start in terms of forum activity and gained a sizable following despite being a new site. The site was actually the result of various Omnimaga members branching off towards their own site due to two years of disagreements about Omnimaga administration. However, CodeWalrus eventually took the form of a programming team and friends hangout that focuses heavily on art and music discussion, promoting notable member projects and calculator game programming in general, whilst allowing the TI community to be more diverse when it comes to different website mentalities. The atmosphere that reigns on CodeWalrus is very similar to what Omnimaga had from 2009 to 2011, although internet memes are less common, and some of the site amenities that Omnimaga permanently lost during their 2014 upgrades were later re-incarnated on CodeWalrus, such as the latest topics list on the front page and board index, as well as the tutorials section. As the members who came from other websites were used to moderate levels of activity there, it was feared that if CodeWalrus would have gotten a slow start, it would scare away newcomers used to higher levels of activity. To reduce risks of this happening, staff commitment requirements were high during the site's early months and expected to remain this way until the website grew a significant fan-base. This eventually proved to be a burden for some staff members when the Winter school semester started up, and as a result, only two of the site founders, DJ Omnimaga and Juju, remained part of the team (although aeTIos and streetwalrus would eventually rejoin a few months later). Facing staff shortage and with a potential hiatus from DJ around Spring, it was feared that the site would no longer be maintainable. After considerations, it was finally decided to restructure the staff system so that it is adapted to the 2015 reality of the TI community and to keep CodeWalrus running. Extra staff positions for members who want to contribute but cannot do so on a regular basis were then open, notably allowing Streetwalrus to rejoin the team. DJ also managed to stay around through the spring, although with diminished activity and duties until Summer began. In September 2015, staff policies were changed to allow more full time staff in the team, but Eiyeron had to step down the next month due to university. Since the site started, Ivoah, Snektron and p2 also joined the team, but Ivoah was demoted in late 2016 due to inactivity. The website has held its first programming contest in May 2015, which had 14 participants who submitted entries for various platforms, half of which were for TI calculators. Its first program to make ticalc.org headlines and contend for a POTY survey was Mana Force, which won the TI-84 Plus CSE/CE BASIC POTY 2015 award. Another contest was held in December 2015, where participants had to make a game based around Walrii, the site mascot. Due to financial constraints, no other contests have been held afterwards and the website became ad-supported. However, during Summer 2016, the Monthly CW Project and Yearly CW Project Awards were instated, where users vote for their favorite monthly CodeWalrus project at the end of each month, then each winner participates into a final yearly poll. Sorunome won the first award with Reuben Quest 3. With most of the staff (including the main founder) moving on to different life interests and social media overtaking forums as main discussion medium, CodeWalrus activity almost moved entirely to Discord during the end of 2017 and the site focus shifted towards gaming and said Discord server, although calculator programming discussion still happens from time to time. Since the CodeWalrus founding was the result of a split of the Omnimaga community (due to irrecoverable differences about its administration and lack of updates), it was initially feared that the site revealing would result in major backlash from various members of other sites. Unlike the BaSiCoDeRz split from SiCoDe in 2000 and the TI-Planet split from TI-BANK in 2011, only a few incidents occurred at first. For the most part these were false or negative remarks about CodeWalrus from a handful of Cemetech and Omnimaga members, which often ended up being publicly divulged on CodeWalrus or met with equally negative remarks by a few CW members. A site defacement incident also occurred in August 9th, performed by a former CW staff member who was also part of Omnimaga staff. He was banned from CodeWalrus for several months and demoted from Omnimaga staff status after this incident, but has since been re-instated on both sites. Forums hits 1666 posts during its first 30 days of operation, one of the fastest start for a new calculator forum. August 7th 2015: Forum reached 20000 posts, but some were lost as a result of the August 9th attack. The site reached 20000 posts again on August 12th of that year. January 2016: Forum reached 30000 posts. June 11th 2016: Forum reached 40000 posts. December 31st 2016: Forum reached 50000 posts. The idea about this website was first discussed somewhere in Early June 2014 between DJ Omnimaga and Pimathbrainiac (who later told Streetwalrus), but the project only officially started for real on October 24th of that year, under the name TI-Walrus. aeTIos and Juju joined the team immediately, although Streetwalrus would join a few days later due to lack of Internet access. The idea was to fill empty gaps in the calculator community by offering people something that had been missing for a while, most importantly the possibility to get more project visibility even if it's not based on a mainstream game genre or franchise. The site primarily focuses on the TI-83 Plus, TI-Nspire and HP Prime calculator platforms, but we also cover mobile and old school game development, as well as all the artistic topics that often comes with it. The site team intends to offer an hostility-free environment towards users of any platform and programming language and to encourage new people to learn.